Plot: On the distant planet Krypton, scientist Jor-El (Nelson Leigh) has discovered his world is being drawn towards its sun. He and his wife, Lara (Luana Walters) prepare an experimental spacecraft that would allow his people to escape the world’s destruction, but only has time to complete a prototype before the cataclysm begins. Unable to rescue the people of Krypton, Jor-El places his infant son Kal-El into the ship and sends him away just before their world is destroyed. Landing on the planet Earth, the infant is found by Eben and Martha Kent (Ed Cassidy and Virginia Carroll), who adopt the child and raise him as their own. As he grows up, young Clark Kent (played by Ralph Hodges as a teenager, then Kirk Alyn as an adult) discovers he has the power to fly, incredible strength, super-hearing, and a sort of “X-Ray vision.” When he reaches adulthood, Eben implores his son to use his power for good. Martha makes a special indestructible uniform from the blankets he was wrapped in on his way to Earth, and Clark goes out into the world. Wearing his costume and using the name “Superman,” Clark saves a train, whose passengers include Daily Planet reporter Lois Lane (Noel Neill) and cub reporter Jimmy Olsen (Tommy Bond), from derailing on a broken track. Clark later approaches Planet editor Perry White (Pierre Watkin) for a job, as working at a newspaper will allow him to stay up-to-date on potential danger that needs Superman’s intervention. Although reluctant to hire the neophyte, Perry gives Clark a chance when he claims to be able to get inside a collapsed mine to get the story. Naturally, Lois is after the same story, and gets trapped inside. As this is a movie serial, this begins a series of disasters roughly every 15 to 20 minutes, which require Superman’s intervention. Clark gets the mine story and the job at the Planet, and both his career and Superman’s begin. 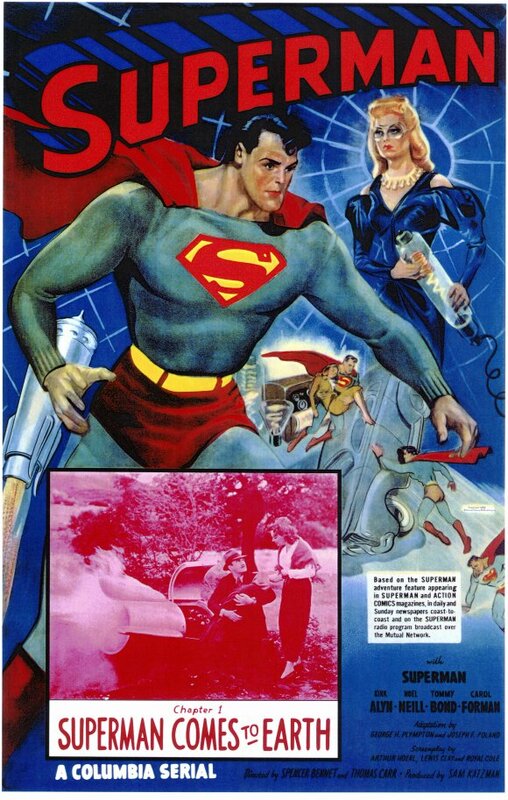 The Man of Steel is soon considered a national hero, and is summoned to Washington D.C. to help guard an experimental “Reducer Ray” developed by the government. A mysterious villainess called the Spider Lady (Carol Forman) plans to turn the technology for evil. A meteor shower later brings chunks of the destroyed planet Krypton to Earth, and Clark discovers exposure to the radioactive rocks saps his power and, with prolonged exposure, could kill him, or at the very least, make it harder for him to wrap this plot up in about seven seconds. Over the course of the serial’s 15 episodes, Spider Lady tries time and again to trap or kill Superman, often with Lois and/or Jimmy (and even Perry White, on rare occasions) getting caught up in the schemes, but he always manages to pull through. In the final segments, the Spider Lady gets on the radio to announce she’s perfected the Reducer Ray and will use it to destroy the Daily Planet building in nearly four hours. Rather than… y’know… evacuate the building, the police ask them to keep quiet and everyone carries on with business as usual. Lois and Jimmy get a tip that the ignition systems of cars are oddly breaking down, and reason that the Ray may be responsible, so they decide to fly a plane into the area. Suddenly, and with no warning (except for the fact that cars are oddly breaking down), their plane breaks down, crashes, and they’re captured again by the Spider-Lady. Superman fakes a Kryptonite reaction to trick one of the Spider Lady’s henchmen to bring him to her hideout. He finally faces the villain, who stumbles into her own device and is killed, proving once again that criminals really need to build their hideouts according to OSHA requirements. Returning to the Planet office, Lois and Jimmy find Clark “asleep” at his desk, wake him, and they all have a good laugh over a woman’s brutal death. Thoughts: It saddens me how Kirk Alyn has been forgotten by so many Superman fans. The first live-action Superman may not have made the mark on history that some of the others did, but by virtue of being first, he deserves at least some respect. It especially saddens me because Alyn is really good in the role. His Clark Kent has a sweet earnestness about him, and his Superman brings just the power the role demands. Alyn seems to take his inspiration from the Max Fleischer-directed animated features from the early 40s, almost perfectly replicating voice actor Bud Collyer’s change in tenor from Clark Kent’s high-pitched “This looks like a job…” then plunging into a powerful baritone with “…for Superman!”Alyn’s performance is almost Collyer’s brought to life. These days, Warner Bros seems intent on keeping every incarnation of the character as different from the others as possible. In 1948 the producers of this film drew on the Collyer’s well-known voice from the shorts and from the radio. The story is even credited as being “adapted from” the popular radio program. Synergy may not have been a corporate buzzword yet, but it was there. Noel Neill was a prototypical Lois Lane, with a wardrobe and hairstyle lifted directly from the comics of the time, and a nice, biting sort of sarcasm that set her eternally apart from the wallflower females that surrounded the typical action hero of the era. Neill’s Lois is smart, confident, and fearless, perfectly willing to stumble into the most dangerous situations in pursuit of her story. At times, this can make her seem reckless or foolhardy, bumbling into the most obvious kind of trap, such as at the end of the series where she has Jimmy fly a plane into an area specifically because car engines are malfunctioning there, never stopping to think that a plane engine isn’t that different a device. There’s a delicate line that has to be walked here – Lois can seem single-minded and even unconcerned with danger, but the minute she looks foolish the character loses everything that makes her work and turns her into the caricature she often becomes in the hands of lesser writers or actresses. Neill usually walks that line very well, rarely straying too far into the territory that makes Lois look bad. This movie serial wraps itself in the trappings of the comic book of the era, including using scenes from the comic to introduce each chapter. The opening chapter on Krypton also feels like a classic sci-fi film – the “distant planet” of “superior aliens” that’s clearly a bunch of guys in robes standing on a set that looks like it was drawn up by the artist of the Buck Rogers comic strip. It’s a little silly, a little cheesy, but all the more charming for that. Even more charming are the special effects, most of which are animated sequences overlaid on the live-action. The first time we see Superman fly, Alyn literally transforms into a cartoon and zooms into a burning building. It was at that point I pretty much fell in love with this film. There’s really no attempt at anything resembling real physics, either. The “Reducer Ray” is powered by the natural reducing rays that bombard Earth all the time (look out your window, you’ll probably see them), and at one point Superman sees through somebody’s disguise by using his X-Ray Vision on a photograph of that person, which is somehow both ludicrous and awesome. It’s interesting how much of a slow burn was permissible back then. The first two chapters of the serial are concerned entirely with Superman’s origins from outer space and establishing himself in Metropolis, both as a hero and as a reporter. There isn’t even a hint of the serial’s main plot – the battle with Spider Lady over the Reducer Ray – until chapter three. These days there’d be a compulsion to work such a thing in artificially, much earlier, possibly even trying to tie it in to the hero’s origin, all supposedly in the name of creating a more “sophisticated” story. If nothing else, this serial is evidence that sometimes a lack of sophistication can be a glorious thing. As is often the case with these older movies, the modern part of the brain feels the need to invoke certain tropes and gimmicks that hadn’t quite been developed yet. In the Chapter 3 cliffhanger, for example, a scientist shows Clark Kent a meteor he has discovered, and Clark collapses, nearly dead. When Chapter 4 begins and Clark lies there, you want to shout at the screen: “It’s Kryptonite, you idiot! Close the box!” But this is 1948 – Superman as a character is only ten years old, and Kryptonite is an even newer invention (first created for the radio show before migrating to the comic books). Being so young, though, the film is also able to avoid certain bits that would become common shtick later on. In later adaptations, if Clark is threatened by Kryptonite when he’s not in his Superman suit he’d come up with some sort of lame excuse to explain why the meteor seemed to affect a mild-mannered reporter. In 1948? What the hell, he’s a scientist, right? Why not reveal your secret identity? If you can’t trust a professor, who can you trust? Alyn would play Superman once more in the 1950 serial Atom Man Vs. Superman, but then was replaced by George Reeves, who went on to play Superman in the Adventures of Superman TV show and wound up pretty much defining the character for over 20 years. We’re going to spend some time tomorrow with Reeves in his one cinematic appearance as the Man of Steel in Superman and the Mole-Men.